Ridley Scott, Cormac McCarthy, Michael Fassbender, Javier Bardem, Penelope Cruz, Cameron Diaz, Brad Pitt. Just the names involved with this film already give off a distinct aroma of class, and with such a star-studded cast, a seminal and highly regarded director and a writer who has done nothing but impress, what could go wrong? Well, apparently most things. With a trailer that makes it out to be an intense, gripping experience, the promise of the film may have affected my overall opinion of it because it was, quite simply, almost unbearably boring. The problem most definitely is not the acting, which on the whole is perfectly accomplished, but rather with the writing, which outright fails to invest you in any of the characters, meaning that however hard the actors try, all you notice is the farcical nature of every situation and the sheer amount of words prevalent in the script. They certainly do come at you like a freight train, but for every meaningful one there’s at least ten inconsequential, pseudo-poetic lexical disasters that really are worth confining to the annals of awful dialogue. Anyone talking to Michael Fassbender’s character has these pearls of wisdom to bestow upon him, and while Javier Bardem brings his A game to the table, playing his character with the exuberance and manic quality that he is so good at portraying, even he succumbs to this curse most of the time. There is one exception in the film where boredom does turn to sheer hilarity in bizarre consequences, but moments like this are far too rare to call any of them a success. The shame is that McCarthy, a writer so capable of delivering the requisite suspense and intelligence to a script, clearly had a vision for this film that by no means came off. It oozes a desire to be epic, but stumbles at every hurdle, throwing at us either the aforementioned unbearable dialogue or extremely long sequences of Fassbender doing nothing in particular, obviously intended to have some sort of effect in terms of characterisation but only serving to make me think about whether or not my shoelaces are untied, and also if the guy next to me was enjoying it just as little as I was, and then on to whether everyone would rather just be in the bar. Once you get to the point where you’re looking around the cinema, you really do know that the film has completely failed to inspire anything in you at all. Having spluttered at engrossing you in the characters, it seems ‘The Counsellor’ plays the only other trick up its sleeve: violence. This seems to kick in suddenly about half way through the film after we’ve had a lot of foreboding about cheese wires and the risky business that is dabbling in the drugs trade in Mexico. Sure enough the completely unexpected happens and it turns out that the drugs trade in Mexico really is a dangerous business and cheese wires (or whatever the heck they are) can do quite a lot of damage to the human anatomy. Who’d have thought it? Its annoying propensity for doing this is prevalent throughout the film, and any chance at creating tension is thrown away at every turn by something like this. Together with disjointed and jarring direction from a beleaguered Ridley Scott, it deviates between the unpleasant and the supposedly profound every other minute and wastes good performances, including a first for about a century from Cameron Diaz, in this miasma of ridiculous language and shots of people looking angry or worried while talking to someone who’s eager only to quote the entire works of TS Eliot. 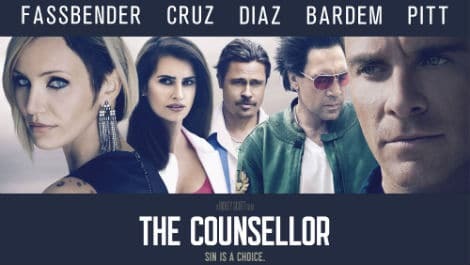 ‘The Counsellor’ is a frustrating experience and one I, surprisingly, don’t recommend. Just watch ‘No Country For Old Men’ instead and pretend this doesn’t exist.